This week's tablehopper: high-tailing it. 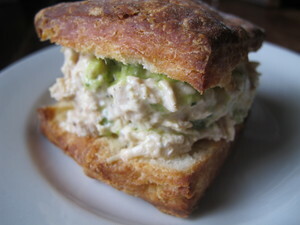 Chicken salad in a biscuit from Wing Wings. I love virtual emails: when you receive this, I will hopefully be on Highway 50 by that point, tooling along in my freshly tuned-up Alfa on my way to Lake Tahoe, probably with some 60s classic rock on (it’s all I like to listen to up there). Suite Judy Blue Eyes, I will be singing along to you! My goal is to make it to the lake in time for a late-afternoon glass of my dad’s homemade wine while on the beach with my parents and sister, and maybe a dip in the lake if it’s not too late in the day. The rain clouds in the forecast, however, might have other plans for me. I am definitely jumping into the big blue on Saturday—gotta have my annual baptism, and feel it down to my tippy toes. I also can’t wait to see the full moon tonight. Arrrrooooooooo! And hello, am so excited about a weekend of home-cooked meals off the grill. Today’s review is a little revisit to Destino, along with a hardhat about the upcoming Southern Pacific Brewing, and a cool culinary event in 707 Scout. Last night I was signing my book at the Forks & Corks event at Fort Mason. Whoa, what a blast to meet so many of you readers there! Thanks for coming, and saying hi. (And now some of you know my name is Marcia, rhymes with Garcia.) And to those of you who are new subscribers, welcome aboard. So, last night was a bit more about Sonoma than celebrating Bastille Day with, say, my preferred poison (Champagne). Not like I don’t drink enough of the stuff already. Did you go out for Bastille Day? It’s funny to think back on my twenties, when I wouldn’t miss that huge crazy party in Belden Place and a chance to flirt with all those Frenchie boys all at once. I also remember ending up in a speakeasy bar one night with one of the waiters from Plouf, and for some reason I vaguely remember seeing Lars Ulrich in a corner booth. Those were the days.